Background & Objective: 6-[(1S)-1-[1-[5-(2-hydroxyethoxy)-2-pyridyl]pyrazol-3-yl]ethyl]- 3H-1,3-benzothiazol-2-one (LY3130481 or CERC-611) is a selective antagonist of AMPA receptors containing transmembrane AMPA receptor regulatory protein (TARP) γ-8 that is under development for epilepsy. The present study provided a broad inquiry into its anticonvulsant properties. LY3130481 was anticonvulsant in multiple acute seizure provocation models in mice and rats. In addition, LY3130481 was effective against absence seizures in the GAERS genetic model and in the Frings mouse model. Likewise, LY3130481 attenuated convulsions in mice and rats with long-term induction of seizures (e.g., corneal, pentylenetetrazole, hippocampal, and amygdala kindled seizures). In slices of epileptic human cortex, LY3130481 significantly decreased neuronal firing frequencies. LY3130481 displaced from rat brain a radioligand specific for AMPA receptors associated with TARP γ-8 whereas non-TARP-selective molecules did not. Binding was also observed in hippocampus freshly transected from a patient. Results & Conclusion: Taken as a whole, the findings reported here establish the broad anticonvulsant efficacy of LY3130481 indicating that blockade of AMPA receptors associated with TARP γ-8 is sufficient for these protective effects. Keywords: AMPA receptors, antagonist, anticonvulsant activity, CERC-611, LY3130481, TARP-g8, transmembrane. Keywords:AMPA receptors, antagonist, anticonvulsant activity, CERC-611, LY3130481, TARP-g8, transmembrane. Abstract:Background & Objective: 6-[(1S)-1-[1-[5-(2-hydroxyethoxy)-2-pyridyl]pyrazol-3-yl]ethyl]- 3H-1,3-benzothiazol-2-one (LY3130481 or CERC-611) is a selective antagonist of AMPA receptors containing transmembrane AMPA receptor regulatory protein (TARP) γ-8 that is under development for epilepsy. The present study provided a broad inquiry into its anticonvulsant properties. 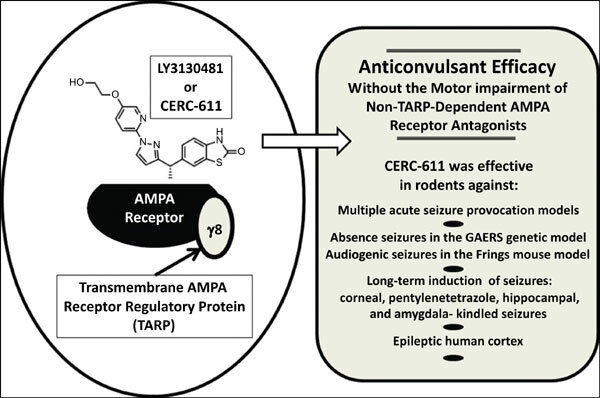 LY3130481 was anticonvulsant in multiple acute seizure provocation models in mice and rats. In addition, LY3130481 was effective against absence seizures in the GAERS genetic model and in the Frings mouse model. Likewise, LY3130481 attenuated convulsions in mice and rats with long-term induction of seizures (e.g., corneal, pentylenetetrazole, hippocampal, and amygdala kindled seizures). In slices of epileptic human cortex, LY3130481 significantly decreased neuronal firing frequencies. LY3130481 displaced from rat brain a radioligand specific for AMPA receptors associated with TARP γ-8 whereas non-TARP-selective molecules did not. Binding was also observed in hippocampus freshly transected from a patient.